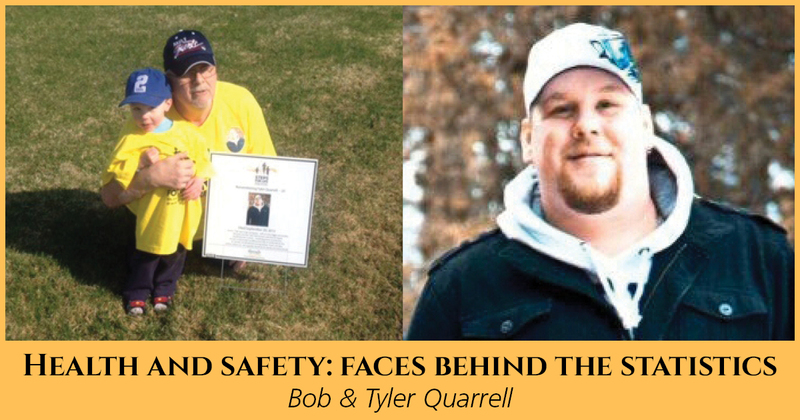 When Bob Quarrell was a young father, the brakes on an underground mine elevator he was riding in failed, first dropping him 170 feet, then bouncing him three times like a yoyo. Bob sustained three fractured vertebrae in his lower spine, and even after multiple surgeries remains permanently injured. But Bob’s greatest injury came with the workplace death of his 27-year-old son Tyler, who suffocated under the weight of an 800-lb slab of granite. To prevent other families from experiencing similar grief, Bob is a member of Threads of Life’s Speakers Bureau and a volunteer family guide. Bob had to learn how to live life without playing hockey, baseball, curling, fishing, or running. He also had to forget about picking up his kids, carrying them to bed, or holding them in his arms when they got hurt. Now Bob and his family are relearning how to live their lives without his 27-year-old son Tyler. Just married and soon to be a father for the second time, Tyler suffocated under the weight of an 800-lb slab of granite. “All alone, pinned against the wall, unable to breathe,” explains Bob. “Threads of Life was there with us through this tragedy,” says Bob. And Bob is there for other families, as a volunteer family guide and a member of our Speakers Bureau. Read more about Bob’s story on page 4 of the Spring 2014 newsletter. Spread the word: let those who need help know where to find it. If you or a loved one have experienced a traumatic fatality or other workplace tragedy, read about how Threads of Life can help you. Back to "Stories of Hope"